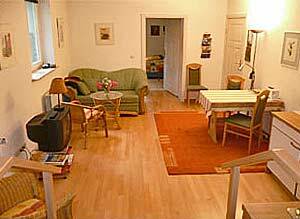 The apartments are located in Heinestrasse, in 14482 Potsdam, Germany. 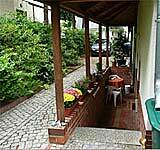 A comfortable accommodation is awaiting those with high expectations, in a pretty double family house, quietly situated in the villa colony of Neu-Babelsberg. We offer 2 non-smoking holiday apartments with internet connections. They are tastefully but practically decorated, and have everything you need for a comfortable stay. The famous Potsdamer Schlösser (castles) and gardens, the historical Potsdam, the family orientated Film Park Babelsberg and the lake and forest landscape are an easy walk, bike ride, drive or trip via local transport (bus, tram, s-bahn) away. This central location will ensure that your holiday is entertaining and relaxing. The pulsating centre of the capital city Berlin can be reached in 30 mins with the s-bahn (city train). A baby travel bed (for up to 3 years) and a child’s chair can be set up if requested. There is a covered storage space for bicycles. A parking place for your car can always be found on the quiet street in front of the house. A covered seating area in the garden can be enjoyed on a pleasant summer evening, or a game of table tennis can be played for those a bit sportier. Pets are not allowed in the apartments. 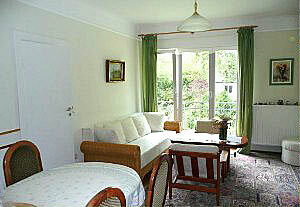 Both holiday apartments have been examined by the German Tourist Board 2007 and have passed their strict criteria. 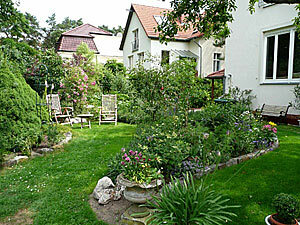 Our villa colony Neubabelsberg near to Griebnitzsees is hidden in a park, garden and tree landscape. Babelsberger Castle and its beautiful park and view of the legendary Glienicker Bridge (agent exchange) are practically on the doorstep. The larger of the holiday apartments is 68 m² in size and lies on the upper level of the house with a view of our lovely garden. It is suitable for 1-4 guests. 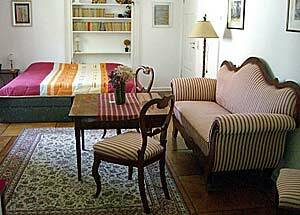 The sunny bedroom has a double bed and wall cupboards, as well as a Biedermeier sitting place. The living room is reached through a door and has a dining table for 4 people and padded chairs. The couch can be opened out into a spacious bed for 2. A wall cupboard, bookshelf, cable TV, CD player and various card and board games are available. 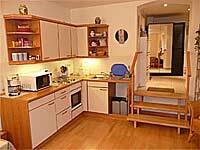 The fully equipped comfort kitchen has a small dining area directly at the window. The bathroom with bath and basin, and the toilet with bidet are in separate rooms. 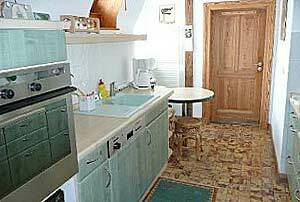 A kitchenette is found in the well equipped living room. It also has a dining table with chairs, seating with a sleeper couch for a 3rd person and a bookshelf, cable TV and radio with CD player. 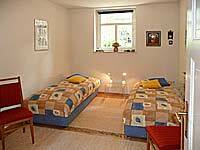 The bedroom has 2 beds which can be differently set up as a single or double bed, 2 chairs, a chest of drawers and a side board. The bathroom has a shower, basin, toilet and a bidet. 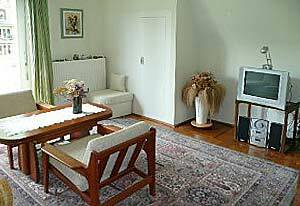 Minimum stay 3 nights, cleaning, linen and towels are included. New Year's Eve there is a minimum stay of 4 nights. Final cleaning is included. The city zone (A) within the S-Bahn-Ring (city train circle) is part of the LEZ. If you do not have a sticker for the LEZ of Berlin city centre, you can find information here, on how to get LEZ stickers for tourists. This property is located outside the LEZ. You can leave your car and take public transport into the LEZ. spam protection: 1 + .3 = <-Please enter the sum.